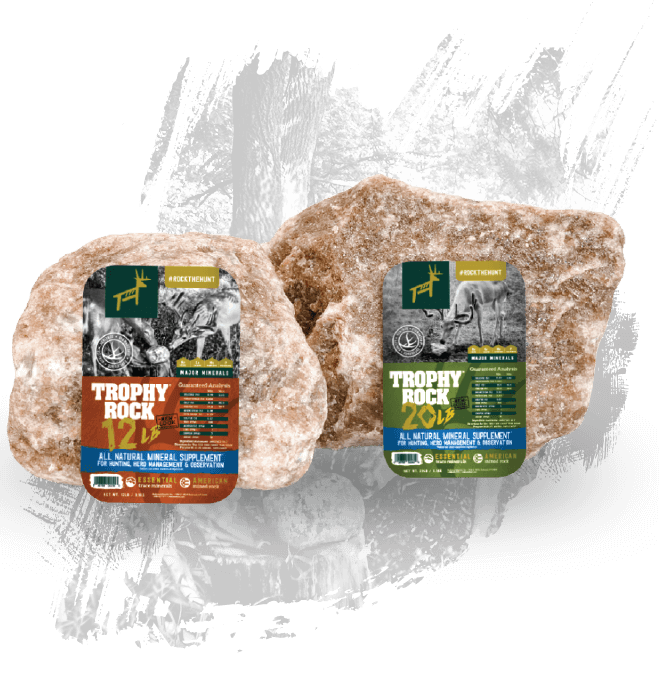 Trophy Rock is an all natural mineral supplement to provide deer with the electrolytes and trace minerals they need for optimum health. Placing Trophy Rock in staging areas or near bedding areas usually works best. We recommend placing Trophy Rock on a stump or another flat rock keeping it up off the ground. It will last much longer in the field if you avoid mud puddles. We have also found deer to be much more relaxed at mineral sites when Trophy Rock is elevated so they can lick on it in less of a defensive posture. These four core values embody our culture, spirit, and dedication to doing what’s right. They keep us aligned and help us make decisions about everything from the way we serve our customers to the products we create. We are hunters, determined to pass on the stories and traditions of those who came before us. Hunting is conservation. We respect and nurture the land so it can give back all we need to sustain life for ourselves and our future generations. Hunting is a chance to get outside and connect with nature. It’s about time spent around a campfire, telling stories and building relationships. We produce products we believe in. Products we can stand behind. We believe in quality of product and ingredients, and finding quality in life by the choices we make everyday.